Thanks, tallbloke. 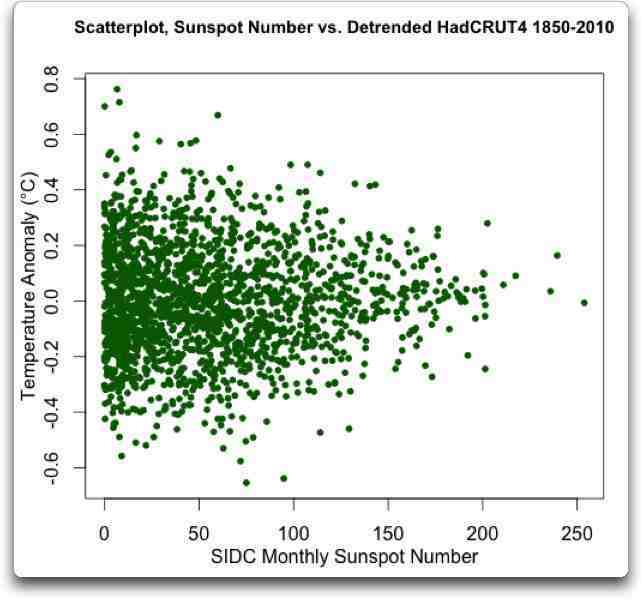 If you’re going to say that there is a relationship between two datasets, say HadCRUT temperatures and sunspots, there’s a couple of things you need to do. First, you need to use all of the data available. You’ve only shown the data from 1955. Next, you need to actually calculate the statistical significance of the relationship. Finally, I prefer scatterplots to time series plots because the human brain is a cycle-finding machine. We survive in large measure because of our ability to anticipate what’s going to happen, based on the fact that we’ve seen a particular cycle before. As a result, we tend to see relationships where none may exist. Now, that one is approaching statistical significance for the trend (although not for the intercept). However, look at the size of the trend—for every hundred sunspots, the land is (supposedly) cooling by three hundredths of a degree … and max sunspots is about 200. So the maximum effect, IF it were statistically significant, is a COOLING as the sun’s activity INCREASES, of about six hundredths of a degree. Willis – of course you are not going to see a relationship in the way you are doing it. If you quickly turn the heat up and down under a pot of water, do you expect you would see a relationship between your instantaneous twisting of the knob and the temperature of the water? Of course not. The scatter plot would look like an amorphous cloud of dots, just like these. You are dealing with a system with enormous thermal mass. I recommend, as a first cut, that you try filtering the sunspot data to lower and lower bandwidth, up to the limiting case of a pure integration. Then see if you don’t start to see a correlation at some point. There are far more sophisticated techniques available, but, you might find something this way. And, don’t detrend the temperature data. The low frequency regime is where you are going to see the action, due to the low pass characteristic of all that thermal mass. 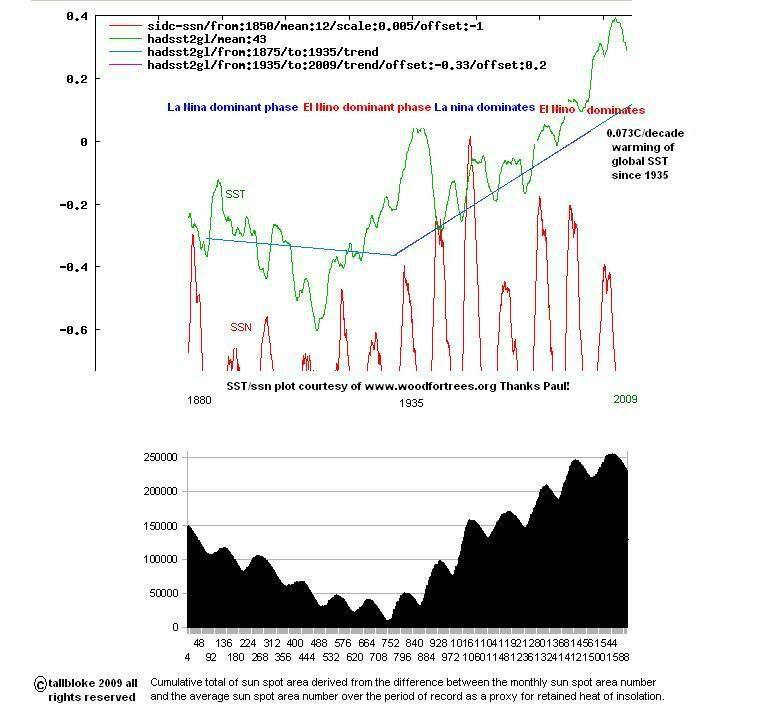 I started work on integrating the solar data to make it more comparable to the high-mass slowly warming and cooling ocean in 2008, culminating this year in my simple model which contains a major solar integration component and successfully replicates HadSSTV3 to an R^2 of 0.9 using monthly data back to 1874. Like smoothing & differentiation, none of us can claim ownership of integration. This is very old knowledge, applied routinely by countless sensible parties within seconds of downloading any time series. Way back whenever, I noticed that the 1940s “bump” (as the climate “scientists” call it) didn’t match the sunspot integral. So why would I even think about using Integer Periodicity Analysis (for e.g. things other than artificial musical performance) when I know in advance that the rhythms (yes: plural) in the data signal cannot be matched with Integer Periodicity? Eschenbach’s “R” code says it loud and clear: it’s integer periodicity that is being sought, and it’s pulse rate that is being ignored, simply because someone believes this “must” be so in the data signal. Oh my oh my. Paul, to some extent I agree. Leif Svalgaard came up with a list of papers going back 30 years or so which integrated the sunspot number. 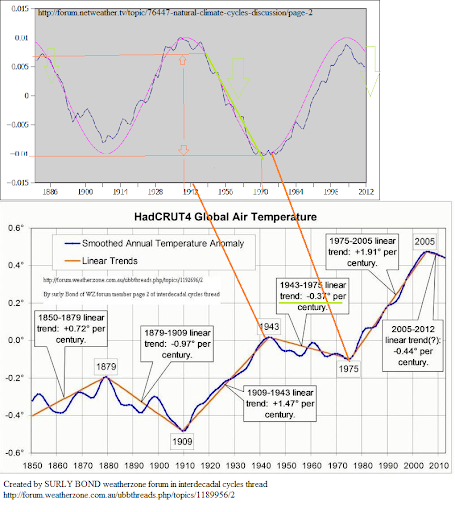 However, so far as I’m aware, I was the first to relate it to ocean heat content, which underlies changes in Earth’s surface temperature, back in 2008. If you have a graphic from before then, bring it on! Donner, R.; & Thiel, M. (2007). Scale-resolved phase coherence analysis of hemispheric sunspot activity: a new look at the north-south asymmetry. Astronomy & Astrophysics 475, L33-L36. Step 1: Aim to become able to easily reproduce their figure 4. (It should take seconds.) Use a wider support span to overcome the “noise” (actually 100% systematic bias to those aware of its origin) in their phase estimates. Caution: Let’s be careful in discussion not to confuse &/or conflate North-South asymmetry on the sun with North-South asymmetry on Earth. Donner & Thiel just happened to be investigating N-S solar asymmetry. Here in this comment I’m suggesting using their paper to learn their quantitative methods so that those methods can be applied to plain sunspot numbers. I’ll consider outlining further refinements voluntarily if several solar & climate enthusiasts clearly overcome step 1. Now: I just wonder if you still think the 1940s “bump” needs shaving? Pumping rate & persistence are the keys. NB: Pulse rate is easily measured using wavelets. The authors of the article you reference have an awfully narrow conception of wavelets. For example, the wavelets I use fall outside of their “wavelet” definition. Sometimes cross-disciplinary communication hits brick walls simply because of semantics & dialects. Let’s slow down here and be sure we understand one another. As doing an integration to get a correlation to the temperature anomaly is just doing a correlation to the monthly temperature change of the temperature anomaly and summing it, I looked for the reason why my much maligned cosine term worked in the 11 year averages of the temperature anomaly change actual and from the correlation. This can be seen in the following two graphics. 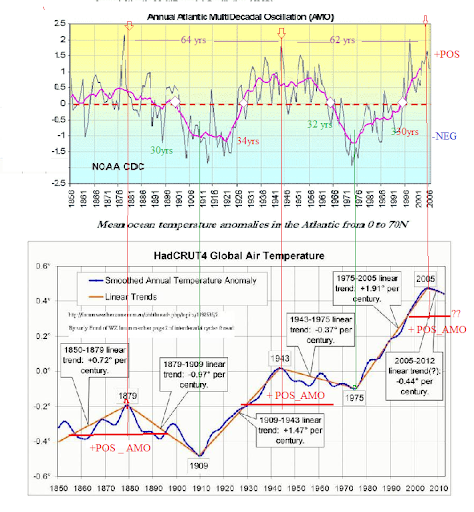 The first graph shows a comparison of the 11 year running average temperature change of the temperature anomaly and the same for the cosine correlation term. The second graph shows a comparison of the cosine correlation to two time dependent cosines. And what shows up but our old friends of frequency 21 to 22 years and 60 to 62 years. RJ, I knew all along that your cosine term was a crude alias of changing sunspot phase. Anyone who does the diagnostics carefully will see this. What darkly ignorant &/or deceptive antagonists falsely assume is noise is largely systematic bias. There seems to be a consensual group mentality intoxicating politically-charged blog discussions, with a seemingly shared aim to dumb things down to an administratively defensible narrative rather than bother risking lost votes by thinking things through carefully, potentially losing voters in the process of making them think hard rather than facilitating fun (political “red meat”) indulgence in an unethical, undeserved town square stoning. You’ve handled it with grace and earned my respect. Sethares, W.A. ; & Staley, T.W. (2001). Meter and periodicity in musical performance. Journal of New Music Research 22(5). Well there you go — absolutely perfect by design for obscuring the nature of solar-terrestrial relations, whether by dark ignorance or by dark deception. Wavelets can be linear-in-period and don’t need to have orthogonal bases as the authors (in their narrow conception of wavelets) falsely suggest. Don’t get me wrong. I admire the intelligence of these authors and I appreciate their work. But their conception of wavelets is (or at least was in 1999 & 2001) insufficiently generalized. Sunspot numbers violate at least 2 of the base assumptions of their methods. Any sensible explorer attempting to employ their methods will see this effortlessly by applying due diagnostic diligence. 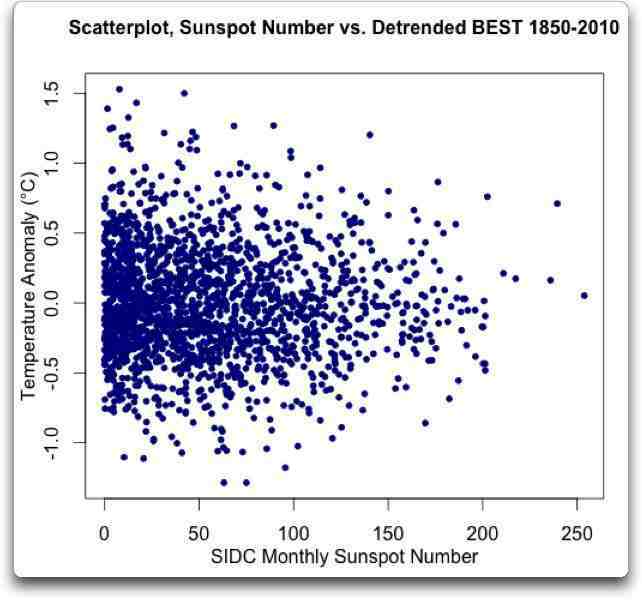 Sethares tried – with sunspot numbers (“[…] the (approximately) 11-year cycle of sunspot activity is repetitious without being periodic […]”) – and didn’t get very far. Donner & Thiel (2007) outline a rock solid method that does the job elegantly — see my comments above. Use the foundation they provide to build a generalized wavelet tachometer, which can be used to measure pumping rate. Although they emphasize “combs” & “prongs”, they don’t emphasize that the width of rake receivers can be tuned at tuned tine-spacing to clearly detect structured (nonuniform) volatility, even in the presence of spatiotemporally-turbulent coupling, mixed spatiotemporally-multipath echoes, & nonlinearity that can – each or in combination – generate mirage (a technical term – somewhat of a misnomer) correlations, which convey information about real (not mirage in a colloquial sense) processes. TB: Sorry if some (not all) of this seems technical overkill for a blog that laudably aims to keep a general audience comfortable, but there was a LOT of very offensive quantitative misinformation in the wuwt article & discussion you reference. It was so bad I boycotted. Leif is a piece of work. But, I’m afraid you played into his hands by becoming enraged, and that set up a contretemps between you and Anthony. Remember, the game isn’t establishing truth vis a vis one person, but in persuading the wider audience. I’m one to talk, since I have many times allowed myself to be goaded by Leif’s either intentional refusal or technical inability to clearly assay the evidence. But, it is something I try to remind myself from time to time as well. The way these guys go about trying to prove non-correlation by creating hopelessly misguided measures of instantaneous, raw measurements, drives me up the wall. It’s like they never graduated from algebra to calculus, and have no inkling of the frequency dependent amplitude and phase response of differential operators. Willis’ silly scatterplots are looking at purely high frequency noise. It is hardly surprising that there is no evident correlation. It would be a major surprise if there were! I quit reading and responding to W’s math puzzles. His ego is too big for interactive blogging and his maths often overreach his understanding of the puzzle. His machine gun nest response to criticism is legend. Anything that comes up short of accolades for his missives is greeted with intemperate volleys of poorly formed imprecations and protestations of people not doing their own homework and other silly distractions. It reminds me of a joke. Just boycott exchanges with the dark agents that are treated by the host as special guests. In more fair forums, simply demand that dark agents of ignorance &/or deception never address you again (if the host lets the problem get that bad in the first place). If laws for online conduct were up to date, we would have the same protections we have in person (against stalking & abusive harassment) and it would be clear that those laws extend into homes. I don’t have a problem with Willis. Some of his puzzles have been interesting and enlightening. I don’t worry too much when he goes off the rails because I think everyone recognizes that he is not claiming a mantle of authority, but is generally trying in his own way to come to grips with a particular concept. Leif, however, does claim a mantle of authority. And, while he is evidently very familiar with specific aspects of solar physics, he does not appear to be well-versed in mathematics in general, and systems theory at all. Some of his statements are just jaw-droppingly from an alternative universe. Yet, he is one of those guys who absolutely will not admit that he does not know everything there is to know, and he doesn’t even think about what others share with him before launching into caustic, and usually ill-conceived, invective. It is a personal NIH syndrome on steroids. I do not much like that fellow, and I usually avoid commenting in the same thread, unless my level of annoyance rises high enough to impel me to do so. I generally regret it afterward, because it is always ultimately futile to attempt to reason with him, and it always ends in an insult match. Yes, I think you were the only one and I appreciated your in sight. I’ve learned much more about solar phenomena since then and I would have framed the article differently knowing what I do now. However I can see the reception would be the same from certain individuals. You can tell the leopard by his spots. I agree with you that it comes down to duration and intensity. Anyone who has experience working with large physical process will know that lesson well. TB: WUWT is good for raising interesting solar & climate topics, but not always for sensible discussion. When you run parallel discussions here, we get the best of both worlds. May I suggest running deliberately mirrored threads when Talkshop-style topics come up at WUWT? My guess is that you could attract some of the more talented & sensible contributors over here where the atmosphere is more harmonious and less thought-policed. To some extent you already do this. I’m suggesting (requesting if you prefer) that you do it more consciously and deliberately, in part to make statements about freedom & harmony, 2 things you do very well. In short: Let’s find a simple, practical way to bypass WUWT’s interference with free, harmonious discussion without giving up WUWT’s topic-raising utility. In time people would know to look here for a better conversation when interesting topics come up. Paul, easily doable. Flag the WUWT post of interest in suggestions and Tim or I will hit the ‘reblog’ button. I went back today to finish reading that post and noticed Anthony had closed the thread and said he had banned discussion on planetary cycles and would no longer support the discussion on his blog. I enjoy reading all cycle researchers findings. I am an AGW skeptic . and believe in the forecast for global cooling for future forecast. I admire the mathematical analysis on this blog but l am not up to par with your level at all. How does each layer of the earths stratosphere and troposphere etc react to a ‘solar flare up’? How and where is this energy dissipated and what are the implications for the lower atmospheric layers? This is going to save time. Arguing on blogs steals time from data exploration. Instead of banning topics, Anthony Watts would be better off moderating those who wreck discussion of them by killing the conversation with false accusations like Leif Svalgaard, and with vicious invective, like Willis Eschenbach does. They have both been banned from this blog for their unreasonable and unpleasant behaviour. The old British name for a scatter gun is a Blunderbuss. Seems appropriate somehow. If you look at the graphic I made back in 2009, you’ll notice that above the SST time series, I noted the periods during which El nino and La nina were dominant. As you can see in comparing the curve of the Sunpot integral and the SST, the SST dips below the Solar integral around the turn of the C20th, and climbs above it in the 1920-1945 period. Assuming the integral is a reasonable proxy for ocean heat content, my conclusion is that some kind of 1940’s ‘hump’ likely did occur, similar to the SST rise to when the 2010 El nino spiked the global and sea surface temperature. Perhaps El nino dominated phases acclelerate to a climax, rather than being a nice sinusoidal progression. ‘Saw-tooth’ behaviour seems fairly common in many natural phenomena. I think the thing to understand here is that the peak of the rise in SST comes some years after the point where average Sunspot number drops below 40SSN and the ocean starts releasing energy instead of gaining it. 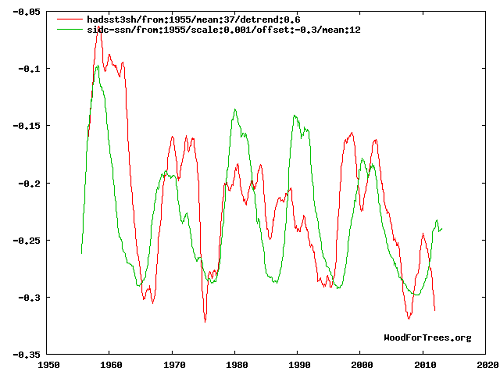 This is why I’m very sceptical of adjustments to the ARGO record and the allegedly rising deep ocean temperatures. The PI, Josh Willis agreed there had been a ‘slight cooling’ since 2003 in an interview in 2007. Craig Loehle found it was still declining to late 2009. Outgoing longwave radiation was rising, incoming solar declining – this means the energy balance had gone negative. That’s when the ‘adjustment’ of the ARGO data started in earnest, and the ‘missing heat must be in the deep ocean’ meme started being pushed. TB – the 1940’s are famously known for Boogie Woogie and Nazi bombs and artillery fire. Either could be responsible for silting up the atmosphere, but my money’s with the Nazis and the global military/industrial response. It looks like a switch mechanism. On/off…up/down …flip/flop…step up/step down..
How can you reconcile this switch like mechanism with solar system dynamics? What celestial event happened in1943 to set of the switch? Hi Crikey: Lots of possibilities for the celestial origin of 60 year cycles, though it should be noted that in the longer term they seem to vary from around 60 year to around 90 year. Both those periods are subharmonics of the ~179 year Jose cycle. 1/3 and 1/2. Also worth noting are the 45 years cycles OR 1/4 of ~179 , Which are evident in the beach ridge formations found in Siberia and Canada on land rising following the melting of the ice sheets of the last glaciation. Have a read of the new thread I posted this morning on Ian Wilson’s findings, that might help. While I am in no way well enough qualified to follow the deeper technicalities here, I am very interested in the outcomes, which I feel are very enlightening and at the same time strike an intuitive chord. I would like to put on record that I have also been intensely disappointed and irritated by the embargoes on certain topics and the emotionally charged negative attitudes, especially by the two resident bulldogs, to same at the-site-that-shall-not-be-named. Thank you TB for providing an alternative forum where open mindedness and civility still rule. Hi Paul, I was wondering how the solar cycle deceleration curve is calculated on your Solar-Terrestrial-Climate 101 plot. Here is a good reference . I have bookmarked for a read tomorrow. “Now, if you look at the three years period from 1952 to 1955, you will see the opposite effect. There is a rapid deceleration of the Sun but a small change in AM, the result is a large spike of sunspot production. Your enthusiasm for discussion is great! I hope you will keep playing an important role stimulating minds. Let’s be careful not to conflate different kinds of deceleration. You’re commenting about deceleration in movement. I’m commenting about FREQUENCY (of a cycle) deceleration — like if you change the speed on a fan. I appreciate everyone’s patience as we strive to communicate carefully. Above I outlined what I called “Step 1”. a) you’ll have only a few trivial steps left to arrive at SCD. b) I’ll be able to efficiently outline those few remaining steps. Given the amount of time I can — and can’t (due to hard constraints like sleep & work) — volunteer, this is the only viable avenue I see under current circumstances and for the foreseeable future. It’s crucial that a handful of capable parties take the steps successfully. I underscore assertively to clowns from other (unnamed) sites that I’m not interested (tolerance completely expired) in political games. Necessity’s invention’s mother. Due to the constraints on my time & resources, I’m only concerning myself with the due appreciation and understanding of a small handful of sensible, capable parties, whoever they may prove to be. Under current circumstances, I can’t afford more. Paul, email sent. 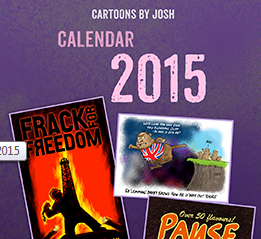 Exciting stuff, a real step forward. I know a lot about earth climatic cycles but this solar system stuff is VERY new to me. I will try and post that tomorrow..
6 monthly data may give an excellent result? There is a name or principle for this? The data collection period needs to be in synch’ or close to the length of cycle.. Thanks Paul, didn’t understand a word but that’s cool. That was a personal derogatory opinion piece with no science or credible rebuttal at all. Haven’t seen that in the science journals?? I got the impression that he believes If a cycle isn’t a constant then its not a cycle..
Willis says he has studied cycles in climate and there isn’t any..Just a chaotic mess. I am very disappointed that Anthony Watts the owner at WUWTblog has allowed this very disrespectful tyrant malign Scafettas research..
Just because Wilis and Anthony can’t see the link between the solar system and the earths climate doesn’t make them correct. I see you as no different.. I am personally offended as a cycle researcher.. I have Scafetta’s reply to Willis ready to roll. Just awaiting some additional info. Let me know when you’ve reproduced Donner & Thiel’s (2007) Figure 4. Willis seems to have blocked my most recent comment on the WUWT blog. He doesn’t even take kindly to friends pointing out his errors. I should have guessed that he’d shuttered his mind when his previous response to a comment on mine was to use the term “my friend”. He’s just left a steaming heap on his own doormat. Bernd: If you kept a copy, repost it here. We run a refuge for censored WUWT comments, just as they are for the occasional one from here. Just this morning I removed one from PopTart, Trolltech, or whatever his name is. Re: tallbloke (Jan 23 13:36), sorry, not that one. My comment was (deliberately) extremely terse but about 100 words long. Tried to address his classification of the parameters as “tuneables” and that his suggestion to instead use a Fourier transform would provide no insight into physical parameters. It’s been a “busy” day with evacuation due to a bushfire nearby. I had 3 things on the go when the evac alerts came through on the phones.. Turns out that the severity of the alert was probably “precautionary”. If evacuees were relying on official advice, they’d still be elsewhere. I’ve been back for 5 hours. Damped down the yard, roof, gutters, etc just in case the fire explodes again overnight and sends embers this way. So I had something better to do. Summer finally catching up. It was cool until Christmas. Now the end of a hot stretch. Fires are absolutely normal, essential for native plant seeding and germination cycles; and not at all related to hot days; just wet season growth (of which there has been a lot in the past year) and the inevitable drying of it when the rains stop. Restrictions on firefighters and fuel reduction burns add to the actual danger. Fuel reduction burns during the cold, damp months are used to eliminate floor litter. When I came to Australia in the late 1960’s, winter burnoffs were done frequently and over wide areas. This meant that there would only be enough fuel for inevitable bush fires from a few years’ growth. But the population has grown and people object to the smell of smoke from the burnoffs in winter. Cognitive dissonance. There’s another month of summer to go. Willis has a mental block about conduction and convection involving non-radiative gases being the primary cause of the mass induced greenhouse effect and has ignored my specific and simple questions on that issue. Leif has a mental block about the likelihood that solar effects other than simple changes in TSI are affecting the global air circulation. Bob Tisdale has a mental block about ENSO being able to change the balance between El Nino and La Nina events over centuries as a result of top down solar effects on the global air circulation and thus cloudiness. R G Brown(and Willis) has a mental block about the adiabatic process convecting heat energy downward on the descent phase by converting PE to KE. Anthony himself has a mental block regarding the possibility that something about the interactions between the sun and its planets goes on to affect internal solar behaviour which in turn affects the global air circulation on Earth. Any attempts to discuss such matters start with condescension and then move on to abuse and sometimes censorship or thread closure. Meanwhile the foul minded and foul mouthed aggression spewed out by Willis is tolerated and even encouraged. The problem for Anthony is that the debate has now moved on from the discredited AGW hypothesis to, instead, discussion as to what really is going on within the climate system. Therefore, unless Anthony moves on and allows wider discussion of the subjects that are anathema to him and his above contributors, WUWT may become a backwater fixated on the continuation of the battle against AGW theory that has already been won.